Yes, I know that the holiday of Halloween (Halloween) has already passed, but I just could not help but share with you a remarkable discovery in the style of the subject. A kind of Tina Artistic Frequency Studios a surprise readers of one of the English-language blogs in the design of the vector form of a stunning collection of different pumpkins (Pumpkins) to celebrate Halloween. These icons can be used for both personal and commercial projects, an archive file format - eps, design - vector. I hope you enjoy. Even if you use this year will not work, then these will come in handy for Halloween the next day all the saints. 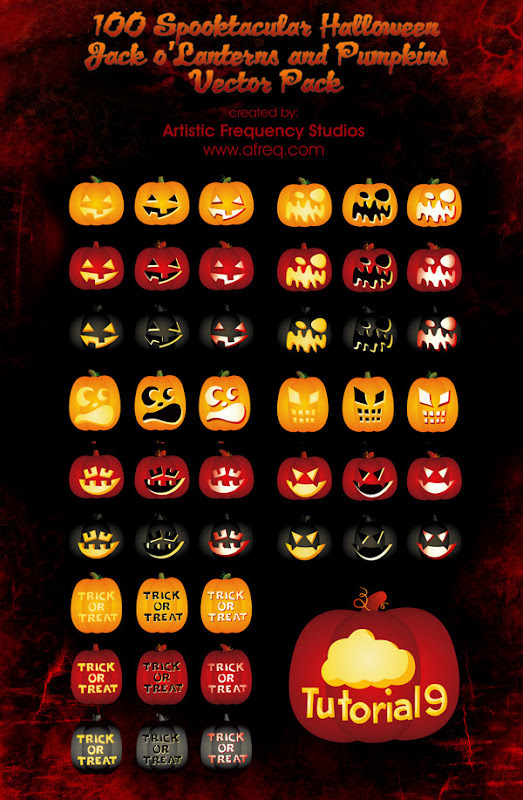 By the way, we should note that I'm not the first time, appeal to the holiday theme - for example, in the pages of the blog has published a post on a similar theme - beautiful icons in the style of Halloween , where you can download three different sets of icons. In addition, for those who want to delve into the history and details of the holiday, you can read the post about Halloween in the Tod's Blog.